"This bracelet is filled with love,laughter, happiness and good times. 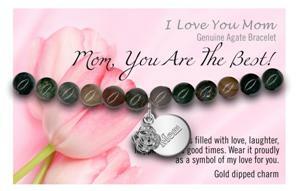 Wear it close to your heart and know how much I love you!" Real Agate gemstones with white gold dipped mom and rose charm.